There’s so much wonderful produce in the Twickenham Farmers’ Market at the moment on Saturday mornings I like to follow their lead and buy what takes my eye as well as the regular things – like the amazingly wonderful mixed salad bag from Chegworth Valley. Last week my sighting of some gorgeous red gooseberries led to me making them into a compote and making a honey panna cotta to go with it. 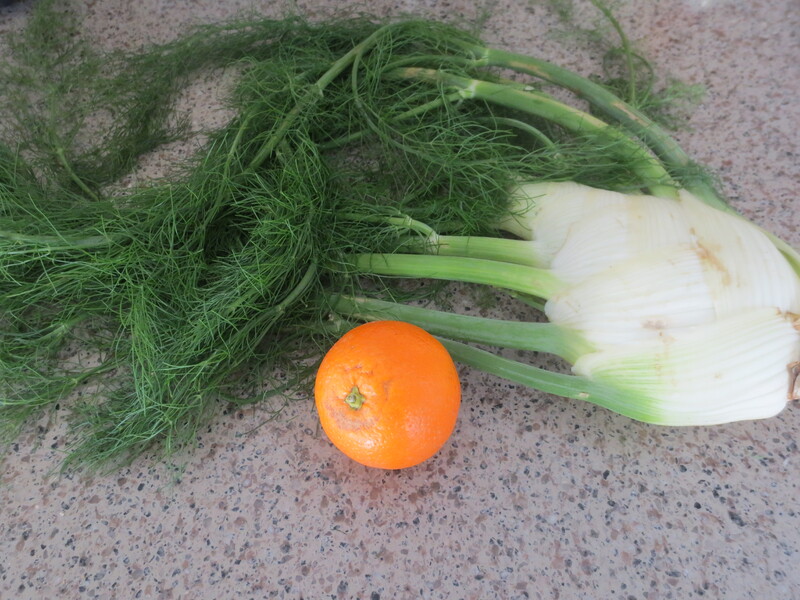 It was while standing in the long queue at the Chegworth Valley stall yesterday that I spied some wonderful fennel. I just couldn’t resist – and bought one for Jonathan and Lyndsey too as I was on my way to see them. I’ve eaten rather a lot of pizza over the last couple of days, taking friends to Ruben’s Refettorio, and brilliant as Igor’s pizza is (Jonathan told me he’d never be found in a well-known chain again even though he’d always thought their pizzas were good; Ruben’s is now the only place to go), I decided on a carbohydrate free meal this evening. I fancied fish and one of my very favourite fish is sea bass and I reckoned that was going to go well with the fennel. I thought some orange would also be a good addition. I’m lucky to have the excellent Sandy’s fishmonger just down the road and so I asked for a small sea bass, the right size for one person. Well, it’s a good job I have a large appetite! And I wasn’t going to worry about the price as it was Sunday. I asked them to clean it but leave the head on. However, when it came to fitting the fish into a suitable ovenproof dish, I ended up cutting the head off myself so it fitted. I cut three slashes each side of the fish, down to – but not damaging – the bone. I rubbed in olive oil and some sea salt, right down into the cuts. 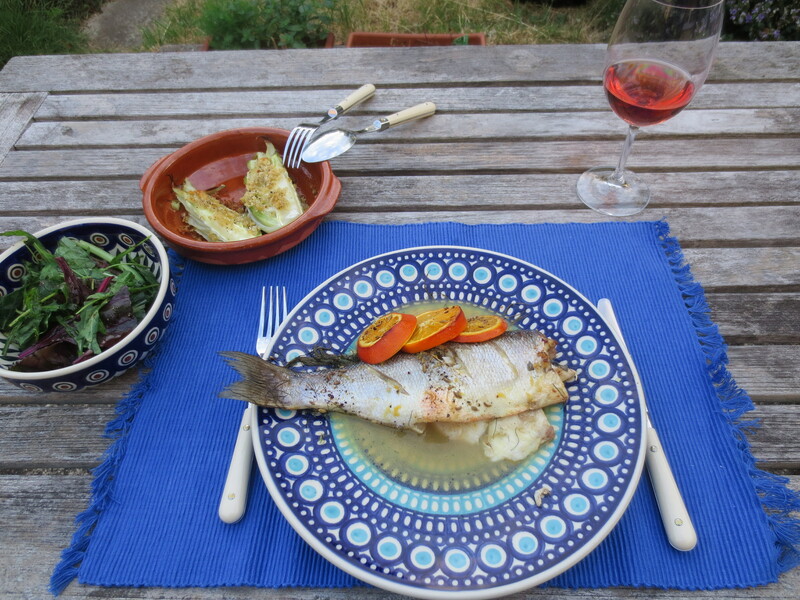 I cut all the fronds from the fennel and lay a bed on the bottom of the dish and put the fish on. Then I stuffed more into the cavity. I sliced an orange (it was a juicing orange as I have them for breakfast, so nice and juicy and sweet) and put two slices in the cavity and lay the other two on top of the fish. 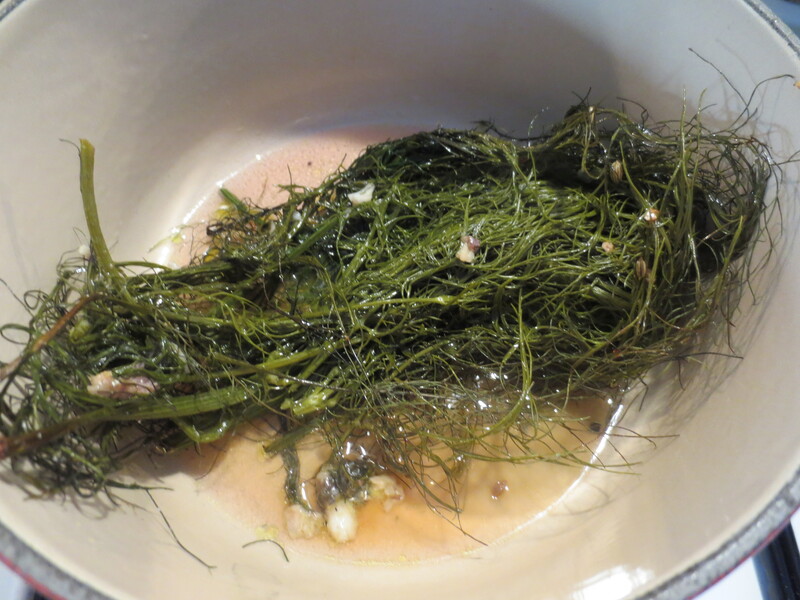 I poured a good glug of dry vermouth over the fennel so the bottom of the dish was just covered. 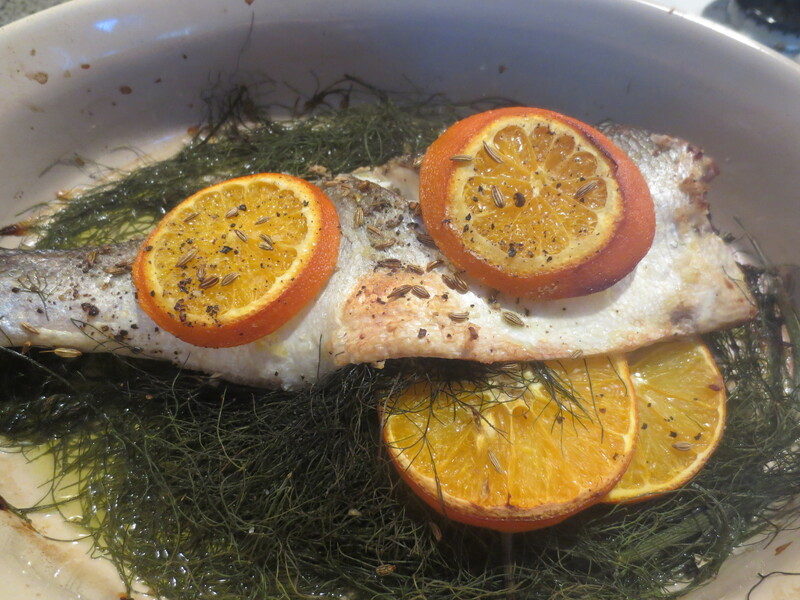 I drizzled a little more oil over the fish and the orange slices. I grated over black pepper and sprinkled over about half a teaspoon of fennel seeds. I put the fish in a 180 Fan oven for 35 minutes – or until the fish was slightly browning and cooked through (test gently with a fork). The cooking time will obviously depend a little on the size of your fish. 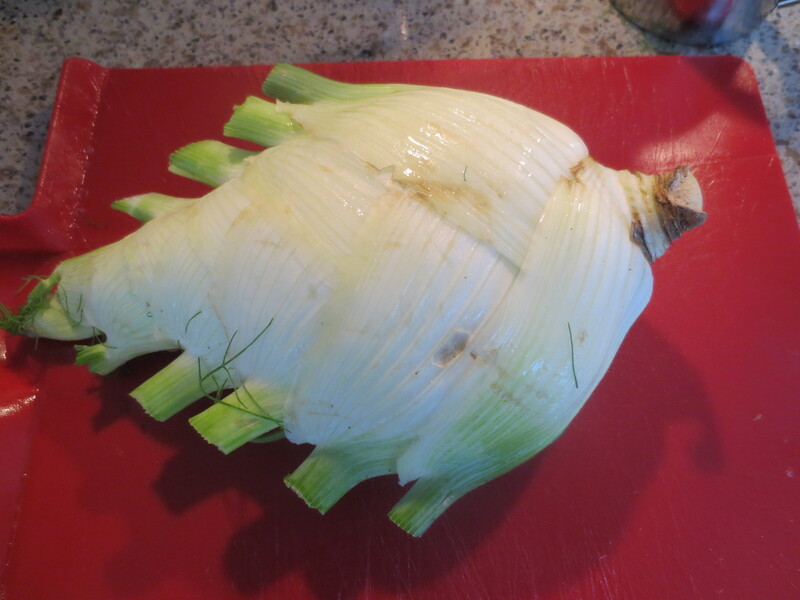 As that cooked I prepared the fennel as a side dish. 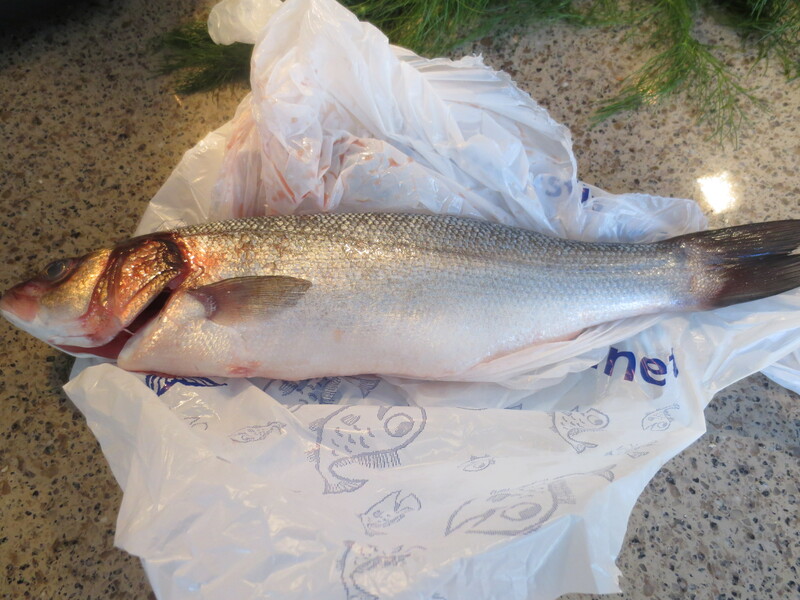 It was huge – and I thought rather fish shaped! I cut it in half and one half in half again. I put the two quarters in salted water to boil briefly and soften slightly (the other half I wrapped and put in the fridge for another time). I drained the fennel pieces and put in a gratin dish. I grated a little bit of stale bread to make some breadcrumbs, added olive oil, salt and pepper, and mixed together with my fingers and then lay on top of the fennel. I drizzled over a little more oil and put in the oven. 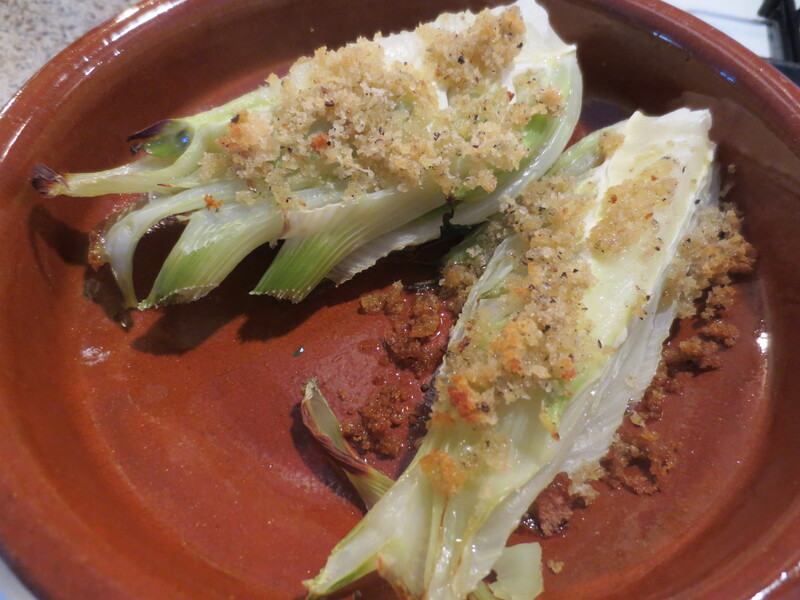 (Usually I add some grated Parmesan to fennel gratin but didn’t want cheese with my fish.) After about half an hour they were nicely browned. 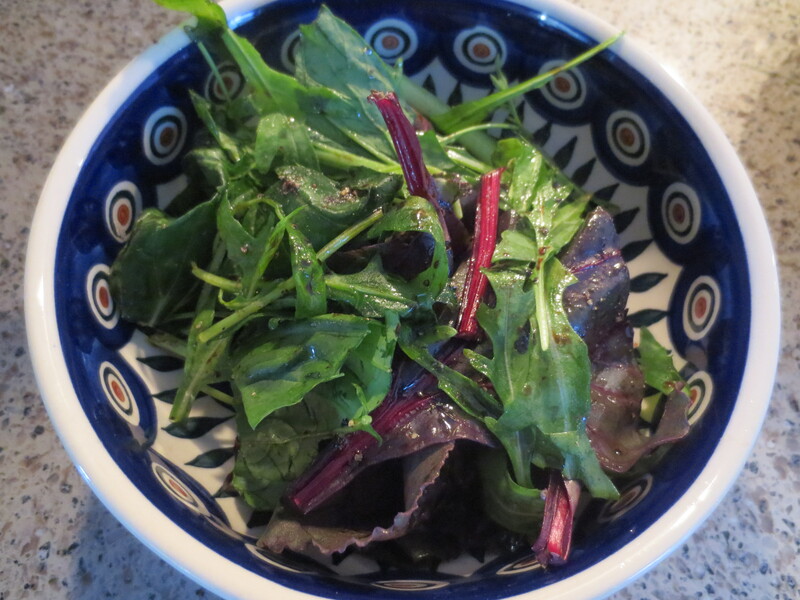 I also made a green salad. 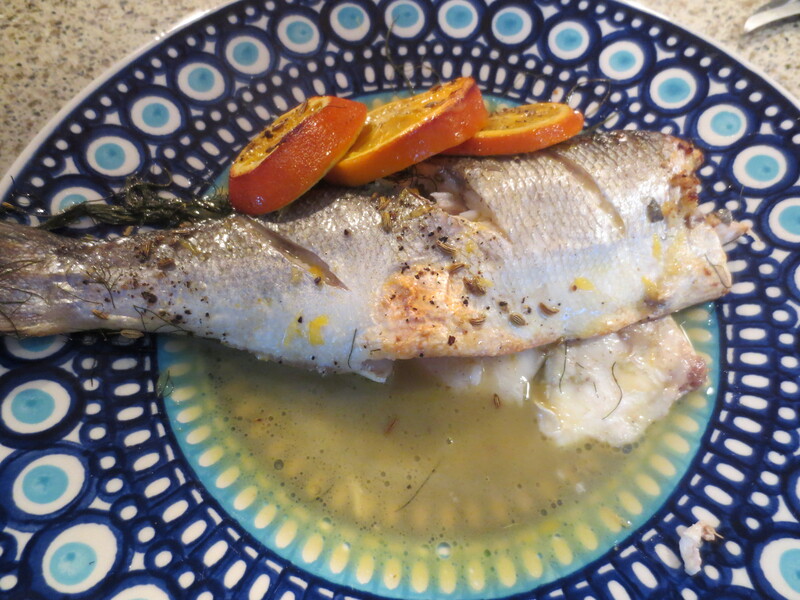 Once my fish was cooked I carefully lifted the fish off the fennel and onto a plate. I scraped the fennel and all the juice into a pan, added a little more liquid (a mix of water and some of the rose wine I was drinking! 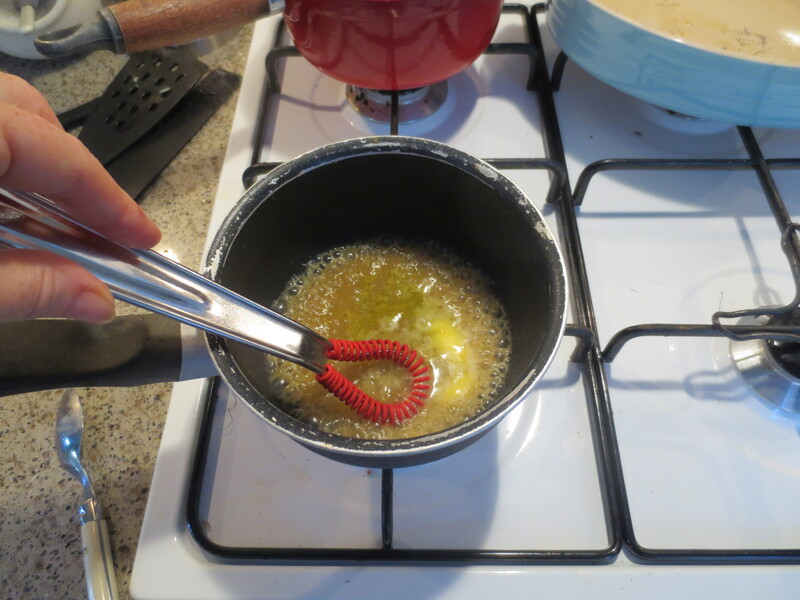 ), let it bubble up and then drained into a smaller saucepan. I added one of the cooked orange slices and pressed the juice out with a fork for a little orange juice to flavour the sauce. I left that to bubble away and thicken a bit. 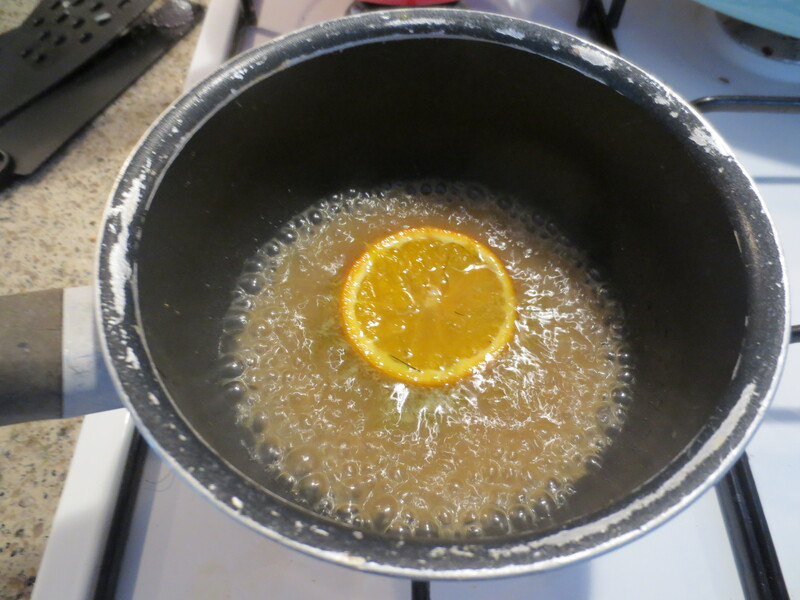 Then I removed the orange slice and whisked in a couple of small lumps of butter to thicken and took from the heat and checked the seasoning. The sauce tasted wonderful: strong flavours of the fish stock, fennel and orange, all perfectly complementary and gorgeous. Then I spooned the sauce carefully over the fish. Although the heat wave is over, it’s still hot here so I took my supper into the garden. It was a perfect summery supper. The fish was delicious. The flavours of the fennel and orange had nicely permeated it yet not overwhelmed it. It was gloriously moist and pulled away from the bone easily. Dipped in just a little of the sauce on its way to my mouth, it was one of those ‘oh wow’ moments. And, with total lack of modesty, and only delight in what I’d cooked, I decided it was one of the very best things I’ve ever cooked for the blog. Many thanks, Jo. I was really pleased with how it turned out and I’m making it again on Sunday for my daughter. Thank you, Sam. I have to confess the plates are ones my son found locally in bargain store TK Maxx and come from Poland. They are gorgeous though, aren’t they?